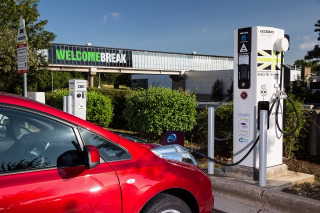 Ecotricity has introduced a £5 fee to use its Electric Highway rapid charging network, in a move which could make it non-viable for plug-in hybrids to use the points. The new scheme replaces the current access cards with an iPhone and Android app, through which users can top up their credit and check availability across the network via its first live map. Users will be charged £5 to plug in for up to 20 minutes, after which time the charging point will cut off. They can then plug in again, for a second £5 fee, to use it for another 20 minutes. Ecotricity customers – those who get their home energy from the company – will still be able to use the network for free. The changes are likely to alter the way the network is being used, particularly related to plug-in hybrids where the £5 fee and limited range will make driving on electricity more expensive than using the petrol engine, even for cars like the Mitsubishi Outlander PHEV which can be rapid charged. Ecotricity says the fees are benchmarked to be cheaper than petrol or diesel. However, with a number of new electric vehicles being launched with larger batteries – such as the Nissan LEAF with its new 30kWh unit – it won’t be possible to get an 80% charge on a single £5 top-up. Speaking last December, Electric Highway’s managing director, Simon Crowfoot, said the new system is expected to cause a short-term drop-off in usage, but added that it would provide some breathing space for the company to expand: “Because of where they’re located on the main arterial roads I don’t think it will detract that much for people who have made that decision [to use an electric vehicle],” he said. The network has played an important role in broadening the usability of electric vehicles. It has almost 40,000 members and includes around 300 charging points across the country. Access has, to date, been offered for free, and members have covered more than 30 million miles since the first units were installed in 2011. Switching to the new fee-based system will take place from the 11th of July, and is a manual job expected to be completed by the 5th of August.